This rare portrait of Sir Francis Drake (c1540-1596) by an unknown artist from the Anglo Dutch School was authenticated by the wart on his nose. Experts say that genuine portraits include the wart, others do not. 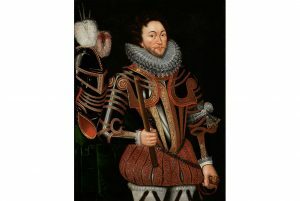 The sea captain, slave trader, naval officer and explorer of the Elizabethan era is shown in expensive half armour as a man of grandeur and social standing.